Are there Federal Regulations regarding hearing aids? Sign a waiver to decline the medical evaluation (only for fully informed adults). Visible congenital traumatic deformity of the ear. Unilateral hearing loss of sudden or recent onset within the previous 90 days. Audiometric air-bone gap equal to or greater than 15dB at 500 Hz, 1000 Hz, and 2000 Hz. Visible evidence of significant cerumen (ear wax) accumulation or a foreign body in the ear canal. Pain or discomfort in the ear. Should you require an extremely powerful hearing aid whose maximum sound pressure level exceeds 132 dB, special care is required in selecting and fitting the hearing aid due to the risk of impairing remaining hearing. 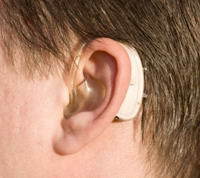 Your audiologist of hearing aid specialist will advise you if you are being fitted with such an instrument.